I haven't posted a new pancake recipe for a few months but I think this one will definitely make up for that! Before I created this recipe I'd planned on adding blueberries to my pancakes for a while but wasn't sure how they'd turn out; luckily the experiment was successful and the result was a delicious stack of pancakes which tasted exactly like a blueberry muffin - plus they're incredibly good for you, so it's a win-win! I'll be posting a recipe on my blog every Monday and Wednesday from now on and vegan lifestyle tips or a product review every Sunday so don't forget to subscribe to my mailing list so you know exactly when there's a new post! 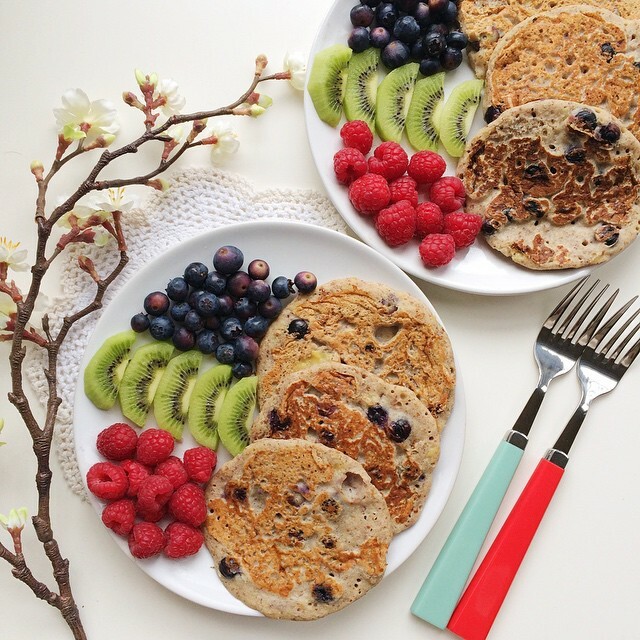 When your flax eggs are ready you can begin making your pancakes. Firstly, sift the flour, baking powder and mixed spice into a large mixing bowl and stir them all together. Mash your banana into a pulp (you can leave behind a few slices to top the pancakes with if you wish) then add it into the bowl along with the non-dairy milk, flax eggs, blueberries and vanilla extract. Mix well until everything is combined - the consistency should be fairly thick, similar to that of cake mixture. Must give these a go. Bookmarked! I tried these and they turned out really delissh! I used swedish blueberries so they got this slight blue/purple colour. I also "unveganized" them a bit using a mix of 50/50 milk and water, and regular eggs as we did not have any flax seeds at home. It worked out fine, the batter was perhaps less thick than it should have been, but I made up for it by frying bigger pancakes. Great recipe, thanks for sharing! They look delicious and I'm definitely going to try this recipe out, just one question though, what is mixed spice and where can it be bought? Just demolished a stack of these; I think they're to become my new go-to grain free pancake recipe! They have the fluffy texture of a regular pancake with the delicious, more complex flavour from the buckwheat :) Next on my list are your gingerbread buckwheat pancakes! Thanks!